To make a wax cast, molten wax is painted into the rubber mould, taking care not to trap any air pockets in the surface and is gradually built up to an even thickness. After trimming any excess from the edges, the sections of the mould are assembled and through an aperture made for the purpose, cooling molten wax is poured in and then out of the mould. This leaves a thin deposit of wax three to six millimetres thick which unites the previously separate sections of wax. 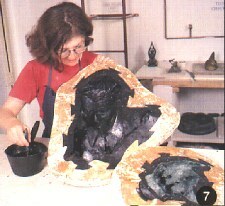 Once cool, the mould is opened and the flexible rubber peeled off the wax to reveal a perfect reproduction of the original sculpture. The thickens of the wax will determine the thickness of the bronze. Joints and scams where different sections of the mould join, need to be filled and the texture on them restored. 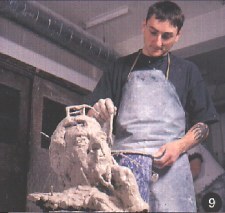 When this modelling is completed as carefully as the original sculpture was made, the finished wax is ready for the next process and can be moulded in a refractory mould. A system of wax rods (runners) are welded to the wax with a hot knife. These will allow metal to run into the sculpture. Smaller rods (risers) allow the air to escape as the metal runs in. Core pins, previously pushed through the wax at strategic points, will ensure that the ceramic walls will not collapse when the wax is 'lost'. 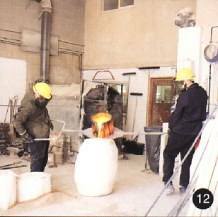 The wax needs to be encased in a mould able to withstand the high temperature required to melt out the wax from inside. It also needs to reproduce in detail the surface of the original sculpture. The traditional material, still used, is a mixture of plaster and grog (crushed and fired clay). This liquid mixture is painted onto the surface of the wax. 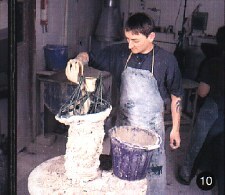 The plaster and grog mix sets rapidly and the hard mixture is formed into a block around the wax. The same mixture is poured inside the wax to form the core. The finished block mould is then placed upside down in a kiln and heated up to 700 C. This melts the wax out of the mould and burns away any residual gases left by the melting wax. 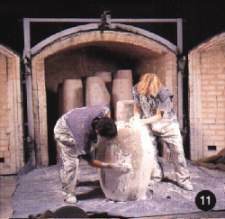 After cooling down to about 100 C the moulds are carefully removed from the kiln and are strengthened with a coat of scrim soaked in plaster. When the mould is suitably strengthened it is filled with molten bronze, an alloy of copper and tin. 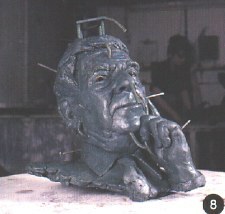 The metal should fill all the space left by the melted wax and the sculpture, complete with its runners and risers, becomes bronze.